Madrid normally played in a 4-3-3 structure with movements similar to their time under Ancelotti. Isco – who played left central midfielder – would move out towards the flank in order to allow Ronaldo inside towards his favored left halfspace. Though at times when Ronaldo wanted to stay on the flank (mostly in transition) Isco would remain inside and help Modric and Kroos keep the ball – using his dribbling ability under pressure he was much more helpful in penetrating Deportivo’s midfield, even though it was rare. Kroos and Modric were normally the only players in the center of the field while Marcelo and Carvajal would push up the flanks. 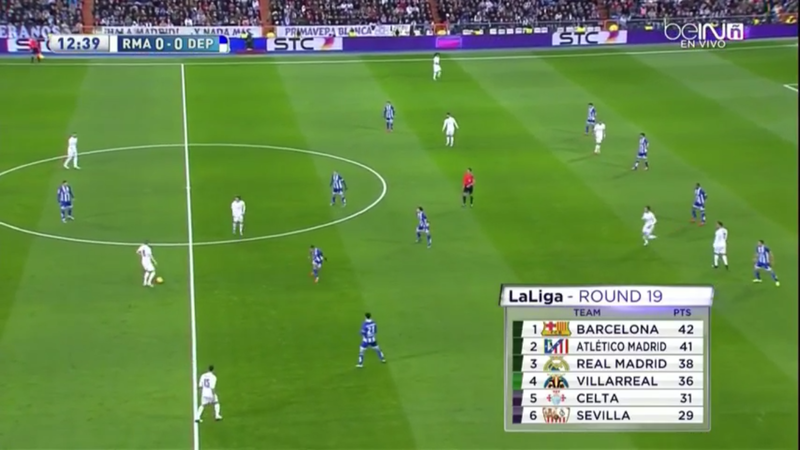 Deportivo played in a 4-5-1 shape defensively from the beginning of the game. Though the left side of the midfield was more narrow than normal as Alberto played more towards the halfspace and even a bit higher at times – similar to a role in which Ronaldo would play for Madrid except with more work rate defensively and nobody occupying the flank behind him as the midfield already had 4 other players. This left long balls into Carvajal (who moved into the halfspace to leave Bale open on the flank quite often) and Bale more open and therefore these types of diagonals occurred more often from Kroos to escape isolation in central midfield. Though when the ball moved to the flank the team was slow to support the ball and Bale frequently became isolated against many opponents. This happened to Marcelo as well. Part of the reason for this is because once the ball moves to the flank, the forward players all shift away towards the far post (normally the BBC) to use their athleticism to attack long diagonals towards their overload on the back-side of the opponent. Because of this though, the player on the ball either became isolated or he had to play the ball backwards – though playing it back into center midfield allowed Kroos and Modric to play quick penetrating diagonals through the defense on the other flank on some occasions. Madrid playing with 2 separate teams on the field! Due to Deportivos lack of presence in their forward line with 1 striker, Madrid were easily able to bypass him and get Kroos and Modric the ball to the side of him and in front of the opponent midfield. This is where the problem of disconnection due to distances in possession reared its ugly head. 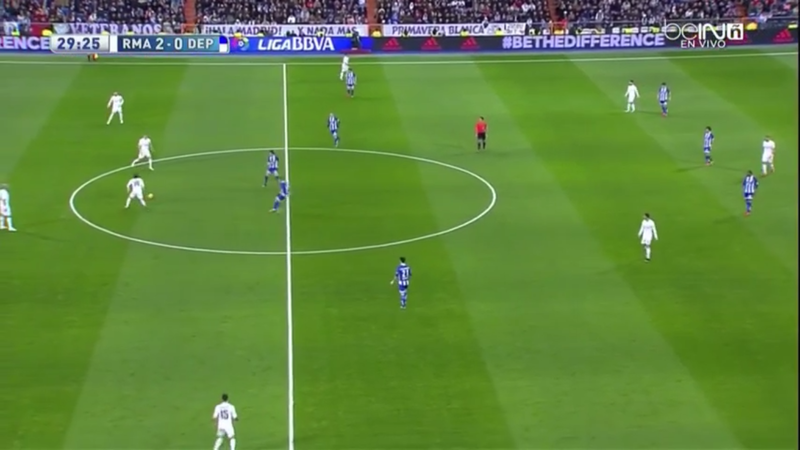 Normally Ronaldo, Benzema, Bale, and even Isco would play very high up in the opponent’s defensive line while nobody dropped into the space between the lines or into the halfspace to connect the midfield to the forwards and move the team up the pitch to penetrate. Modric vs. Everyone! Who wins? There was even a situation in which Modric was by himself in central midfield while everyone else was in the forward line. Of course – because he is Modric – he dribbled all of his opponents and played a pass through the midfield into one of the forwards. This is where Real Madrid’s talents can make up for some of the strategic and tactical deficiencies of the coaches – nobody is sure if this will continue under Zidane but it was very obvious it originated under Benitez. The best moments of Madrid (which also resulted in some goals – particularly the Bale header) were when either Isco or Benzema dropped deeper and were available for Kroos or Modric to pass into. This offered the midfielders a connection to the forwards through a pressure resistant dribbler. Even if the players were positionally spaced out properly for every situation, they were able to use their ability to dribble and combine under pressure while at least one of the forwards dropped in to break through the opponent midfield and then play through the defensive line with multiple options. Problems also arose at times when too many players dropped away from the forward line at one time which left Madrid with no presence up front – which is the exact opposite of what their usual problem is, finding that balance between the two will be key. As I mentioned earlier, it was Isco who would shift out of the center of the field and towards the left flank to make up for Ronaldo’s lack of tracking back into midfield. This would at times form a 4-4-2 as we are accustomed to seeing from Madrid while Bale dropped into the midfield on the opposite flank. Though in this game under Zidane, their shape was most often a clear 4-3-3 structure, which sometimes had narrow wingers and looked like a 4-3-2-1 (that would be a really nice progression in the future). Problems arose in their high pressing 4-3-3 shape. As the 3 forwards would press the back line and the 2 #8s behind them would follow up (and man mark anyone who would move into their zone), the defensive line remained deeper which caused some problems in access to chipped balls into the midfield. At times Kroos would join the high press and a long chip in front of Madrid’s defensive line would be allowed to be brought down and circulated. The most common holes in the press were in front of the Madrid fullbacks and to the sides of the Madrid central midfielders. Deportivo would split their central defenders while their defensive midfielder dropped into the center and the fullbacks pushed higher. Ronaldo and Bale tried to put their fullbacks in their cover shadows while pressing Deportivo’s central defenders with Benzema. This would normally be a very nice idea – but it lacked the follow up coverage from the fullbacks should the ball beat either Bale or Ronaldo. So the ball was frequently chipped towards the open fullbacks who could turn forward and dribble up the field while Madrid’s fullbacks had to leave their position to pressure the ball without proper coverage or drop deep and concede space to Deportivo. Once Madrid’s press was beaten Los Blancos were slow to shift towards the ball and get back behind the ball. 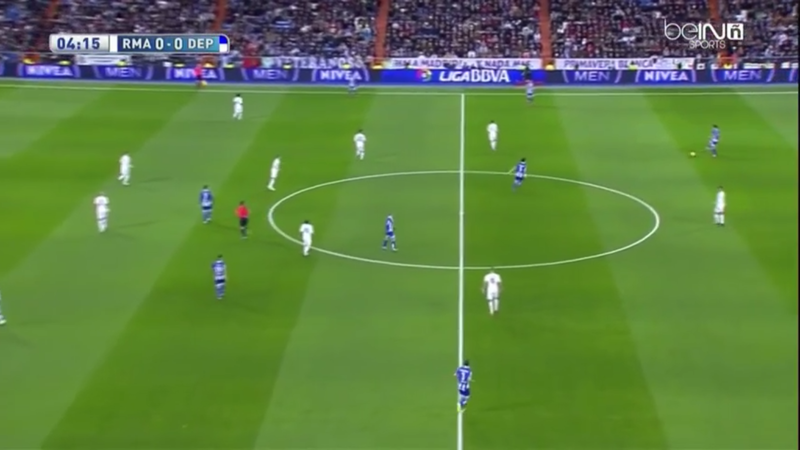 The spaces in the center of the field (behind Madrid’s central striker) and to the sides of the central midfielders were where Deportivo most often had the ball without pressure and were able to circulate against Real Madrid’s block. Deportivo’s central midfielders were able to play the ball easily from one flank to other and expose Madrid’s lack of access to the wings. Nearly all of Deportivo’s most dangerous chances came from either long un-pressured diagonals from the flank towards the far post or from combinations stemming from the wing and moving towards the center of the field. There were promising signs from this new Madrid under Zidane. The roles in offense which are similar to the time under Ancelotti fits the players’ characteristics very well and the defensive movement look like the proper base is being set, but it just needs more time. The narrow 4-3-3 which controls the center and halfspaces would be very good with improved pressuring within and outside of the shape, as well as their usual asymmetrical 4-4-2 shape. The distances and disconnection between the midfield and offense in possession looks obvious and Madrid fans should expect it to be fixed, but only time can tell. It looks like the talented players will be able to make up for some deficiencies in Zidane’s coaching while his coaching well get them player better football than they had under Benitez. Hopefully the head galactico gets time to implement his system so we truly see his style. My favorite picture for evidence against having huge distances within the team! The main problem to their inability to win back ball is Ronaldo. He is the root one problem. He always leaves his full back unmarked forcing the entire midfield to shift and this creates unmarked men in midfield. To play real is easy tactically. Keep the ball on the wing and fullbacks area so that you can drag the midfielders out of position. If you want proof for what one player especially a left winger can do to destroy entire teams defensive plan.. Look no further than Real Madrid and Ronaldo.